Imprint Method: Direct Print - Sip in style whether it's cold or hot when you invest in this 17 oz. matte soft touch steel bottle! With double wall stainless steel construction, vacuum insulation and copper lining, this polished bottle keeps your favorite drinks hot for up to 12 hours or cold for up to 48 hours. This makes a great gift for onboarding employees or clients, so make this your next giveaway. 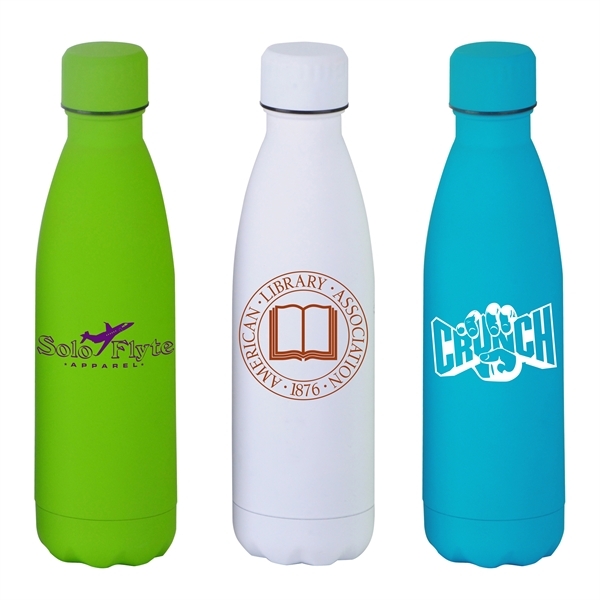 You can customize it with your brand name or logo by using our direct print method. Choose from our selection of fun colors. When the cap is affixed and the bottle is filled with liquid, the capacity is 16 oz. Take your business on the go with this useful promo!